So much to see, and so little time! 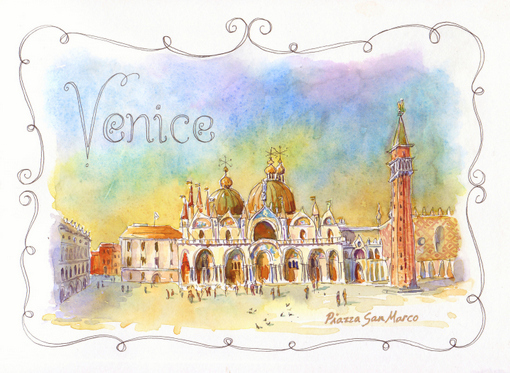 That's what it felt like on my one day in Venice. Of course I toured St. Mark's Basilica, visited the Rialto Market, and strolled along the Grand Canal, but one of the best things I did that day was to take the time to wander off into the side streets and explore. This quiet, shadowy scene was just around the corner from the hustle and bustle of Piazza San Marco but seemed a world away. I tried something different with the lettering on this page. I wrote the text with a dark purple gel pen first, then went over it again with a metallic blue gel pen, moving the text just a smidge to the right, for a nice shadow effect. I used the same blue pen to draw parallel lines on the background surrounding the sketch, just to add a little interest and sparkle. 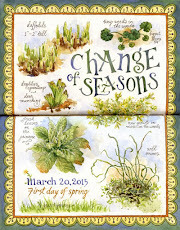 In two days I'll be announcing a fun February giveaway - stop by on Saturday and see what's up! I just recently discovered Sakura Gelly Roll gel pens and have found they're great for adding titles and text to a sketchbook page. The ink flows smoothly on any paper and they come in a nice selection of colors. I used a line of dots to connect the two sketches and add a decorative element to the page. Spattered paint suggests the texture of the stone pavers and/or pigeon food. 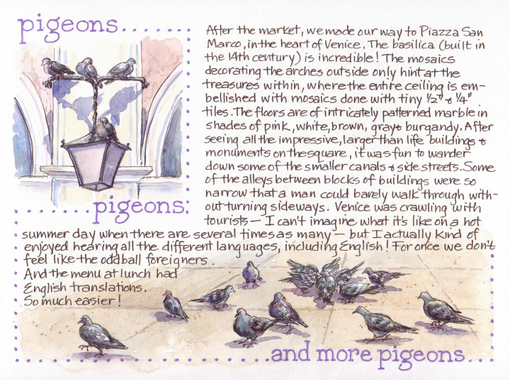 There you have it - a pretty pink and purple pigeon page! 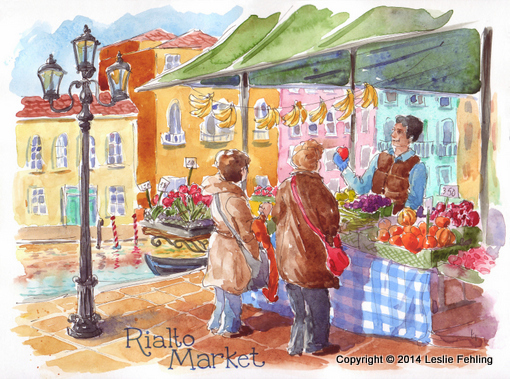 While winter winds howl outside and the temps hover around zero here in Pennsylvania, I've been contentedly ensconced in my studio, painting the colorful fruits and vegetables at the Rialto Market in Venice. 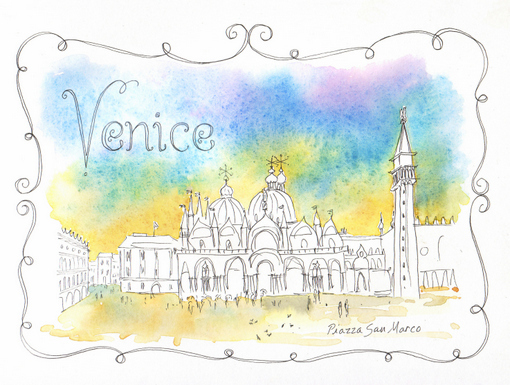 I did the drawing on this page in Venice while being serenaded by a musical ensemble playing lovely Italian classics in the pavilion behind me. It was a cool morning, but the sun was warm as I sat watching Italian housewives buying their groceries for the day. Gondolas glided by on the Grand Canal. I almost had to pinch myself to believe it was all real. 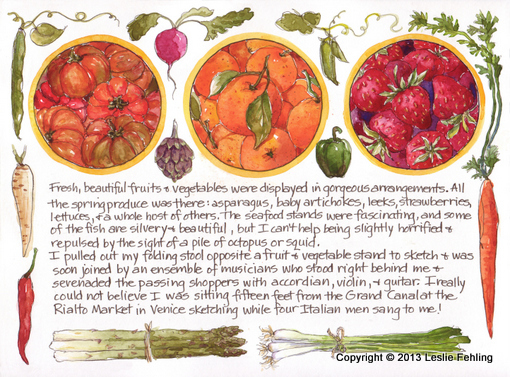 The produce in Italy is absolutely gorgeous! Wandering through the market, I took a ridiculous number of pictures of asparagus, strawberries, beans, peppers, carrots, radicchio, and the prettiest purple baby artichokes you'd ever want to see. I love how this page turned out. 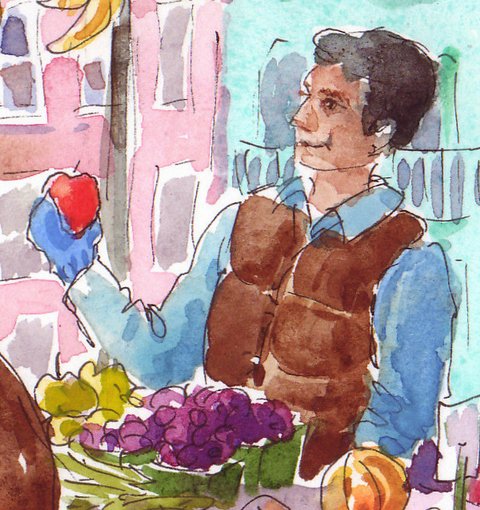 It's jam-packed with stuff, just like the fruit and vegetable stands at the Rialto Market. And it was fun trying a different sort of page layout. 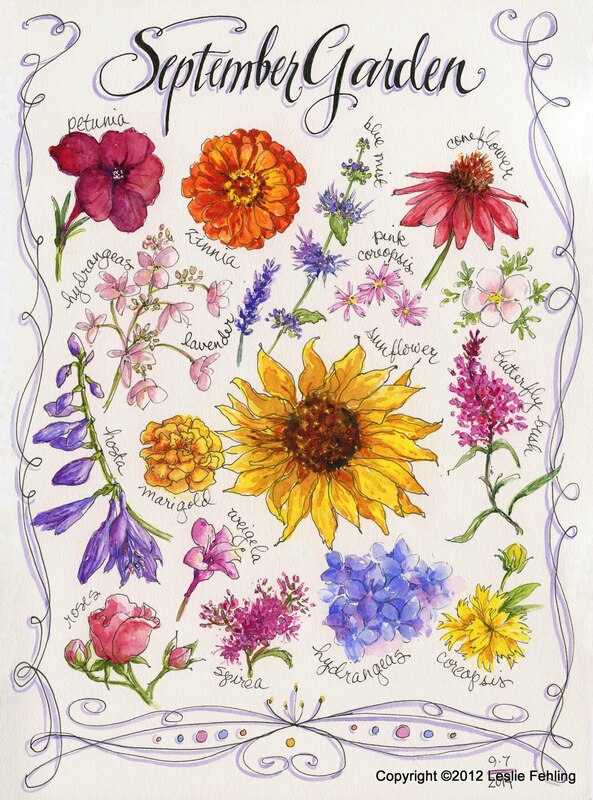 I penciled in the circles that day at the market and jotted down what I planned to paint in each of them, then I did my journaling that evening, leaving plenty of space around the text for borders or...something. 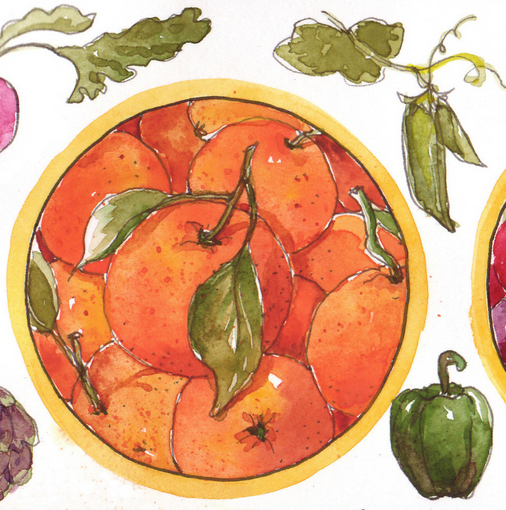 Last week, when it came time to work on this page, I decided I had so many pretty pictures of fresh fruits and veggies that I wanted to include them all. 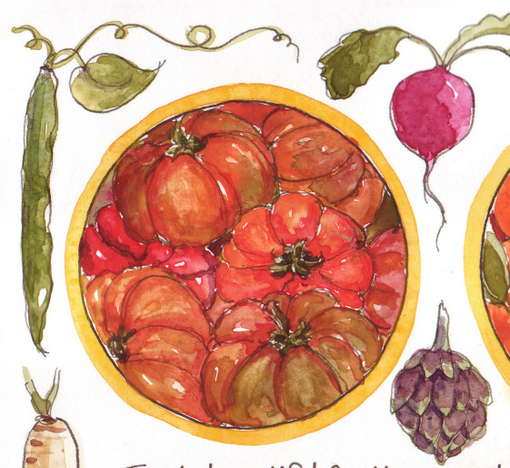 I painted the tomatoes, oranges and strawberries in the circles, then, instead of a border, I squeezed the other vegetables in around the circles and text. Now, on to the next page! 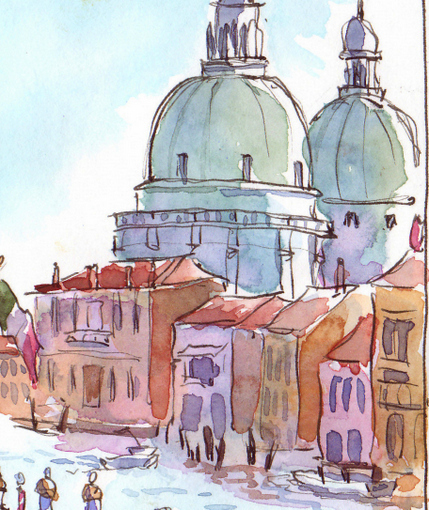 As I rode the train from Vicenza to Venice on Day 9 of my Italian adventure, the colors were soft and muted. Church spires peeked above the fog as we passed by small towns and farms. 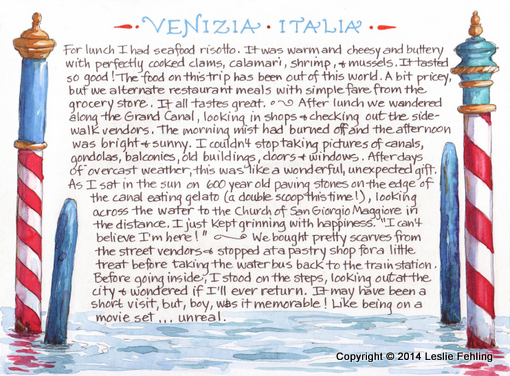 It was a quiet, relaxed trip, and I had a chance to sketch the pretty countryside as we rambled along. As we cruised down the Grand Canal, gaping at centuries-old homes, cathedrals, and public buildings (and boats everywhere! ), I found it difficult to take it all in. I was actually in VENICE!! It was historic, beautiful, busy, colorful, charming, and utterly unique. 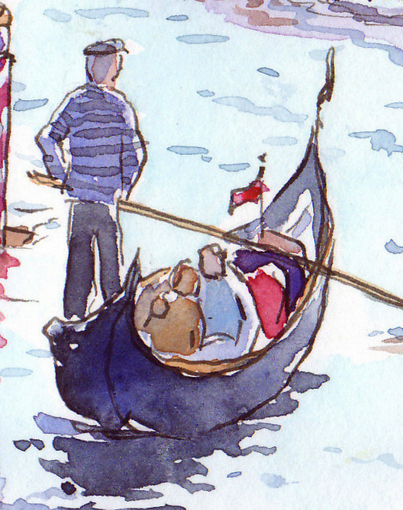 The gondolas were gorgeous, and the gondoliers looked pretty spiffy, too, in their traditional striped shirts and jaunty caps. 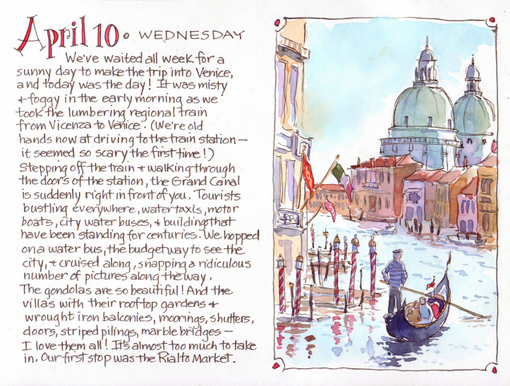 Although I wrote in my travel journal every day while I was in Italy and faithfully recorded where we went and what we saw, I didn't always have time to do as many sketches as I wanted. So, I planned ahead and left space for the images I wanted to draw and paint later, making a pencil notation on the page of what the subject matter would be, and drawing a rough border outline of the space, so I knew to keep my text out of that area. Hearing the camera clicking away every few seconds always makes me feel a little rushed and frantic, so I painted this very quickly. Maybe it's a good thing though, because it forced me to simplify and paint more boldly. I hope you like it. By the way, I've added a "Videos" tab, above, where you can conveniently access all my videos. 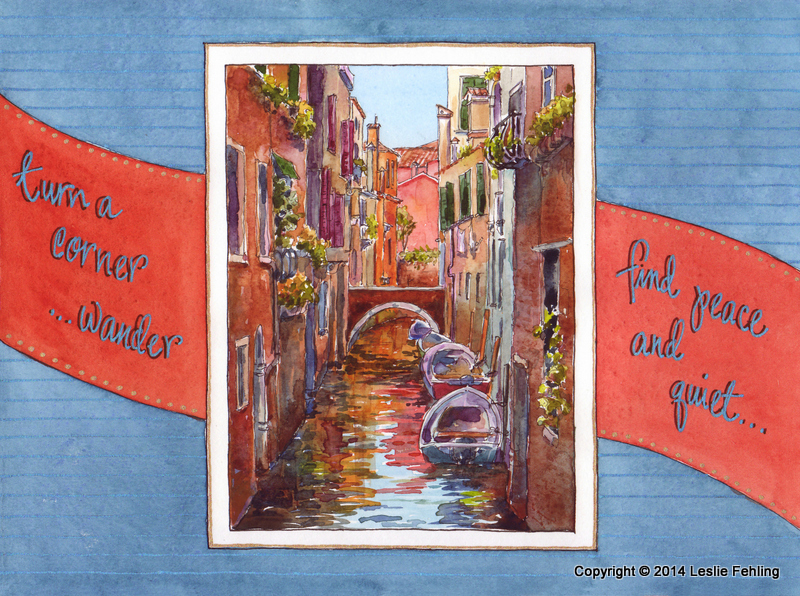 Ready to escape to Italy for some fun in the sun? Come along with me as I work on finishing up the travel journal I started on my two-week trip to northern Italy and Tuscany last spring. 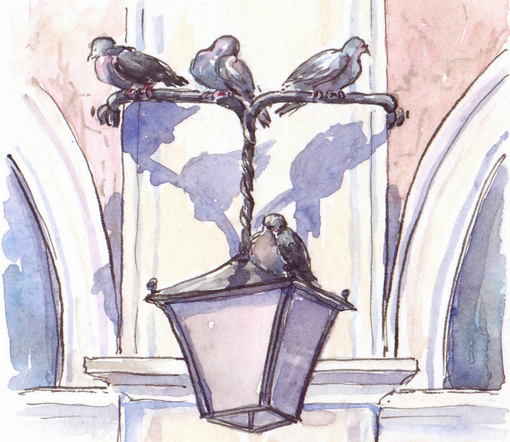 I worked feverishly on the sketches last spring and summer, adding watercolor to line drawings I had done on location, then took a little breather as I focused on other projects. 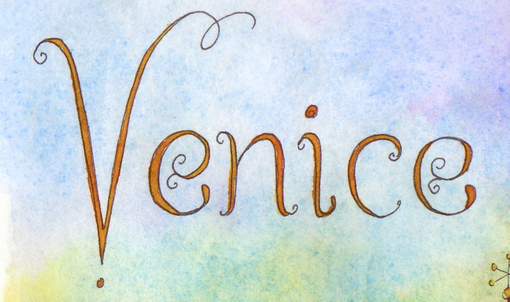 Now I'm anxious to finish what I started, so, over the next few weeks, I'll be posting sketches from the second half of the trip when I visited Venice, Vicenza, and Tuscany. 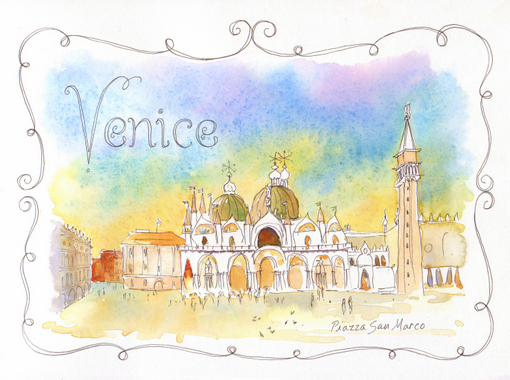 We only had one day in Venice, but what a perfect day it was! It felt like a dream, and all day long I marveled that I was actually walking in the places that I had been seeing all my life in movies, photographs, and paintings. 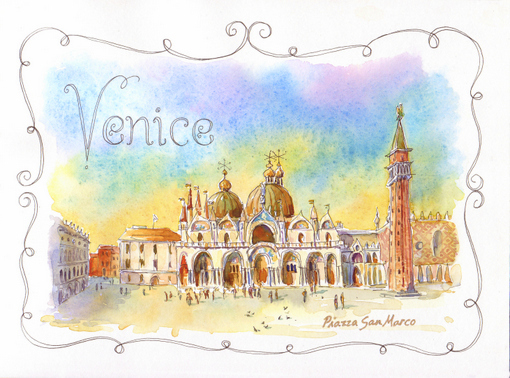 The most popular tourist destination in Venice is the Piazza San Marco, which has been painted by master artists for centuries. I couldn't wait to pull out my camp stool and sit myself down in the spot where Renoir had set up his easel. 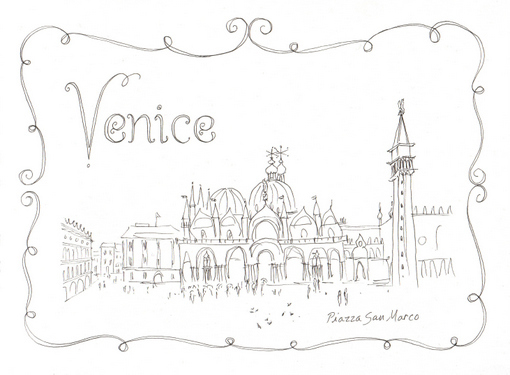 My quick little 15-minute ink drawing did more to capture Venice in my heart than all the photos I took that day. 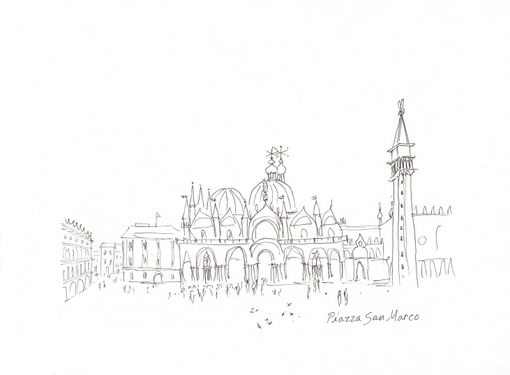 1 - On location in St. Mark's Square, I drew the sketchiest of outlines in pencil first, just to get the composition situated on the page, then began drawing the buildings with a Pigma Micron 01 black pen. I didn't have much time to spend on the drawing, and it's wobbly and inaccurate, but I think I managed to capture the essence of the scene. 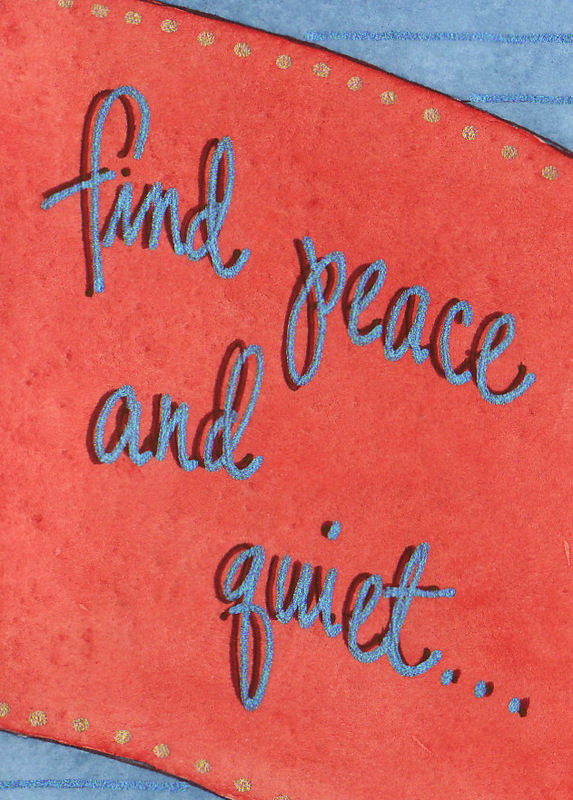 2 - Later, back home in my studio, I added the swirly border and lettering. 3 - After all the ink work was finished, I wet the entire sky area with water and dropped in a variety of colors: cerulean blue, cadmium yellow medium, ultramarine blue light, and rose violet. The sky may look a little wild and crazy, but I wanted this sketch to have a "party" feel to it, to convey how lighthearted and happy I felt that day. Using bright colors and the curlicue border were a good way to set the mood. 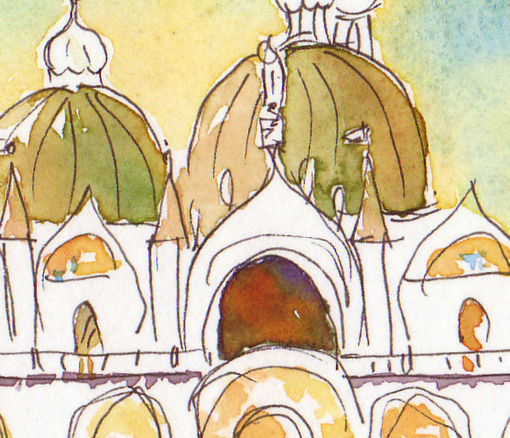 4 - Next I began to add the first washes of color to St. Mark's Basilica and the surrounding buildings. 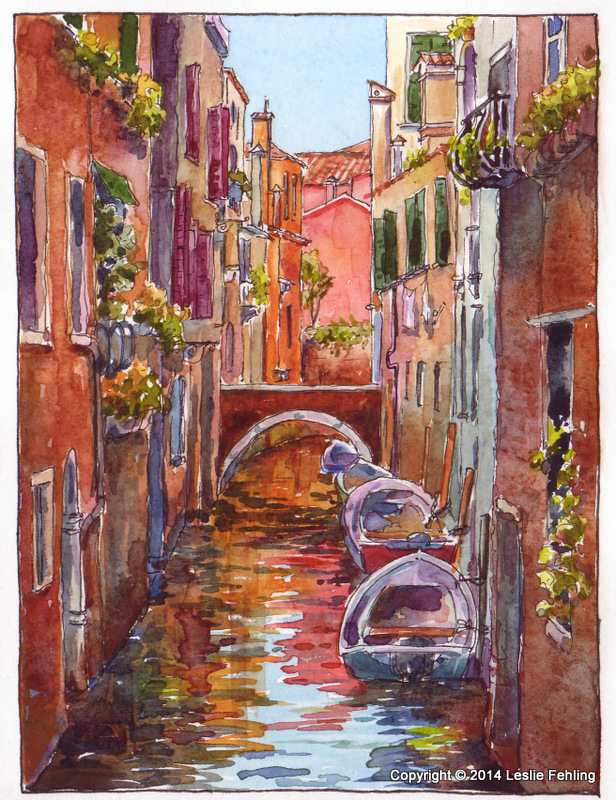 I applied colors wet-in-wet in some of these first washes to encourage them to merge and blend. 5 - In the next step I begin to define the architecture more fully with darker tones and shadows. I also painted the people in the mid-ground and added their shadows. Colors used were quinacridone gold, raw sienna, yellow ochre, olive green, ultramarine blue light, cerulean blue, and permanent alizarin crimson. 6 - I decided the brightness of the sky was a distraction to the painting, so I put a pale grey wash over the right part of it, thinking it might make the buildings pop forward. I'm not sure it was the right decision, although it doesn't look as dull in person as it does in these scanned images. 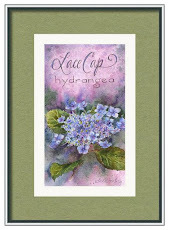 7 - The border and text were filled in with quinacridone gold. 8 - As a final touch of whimsy, I added dots of color at random around the border. It's finished! 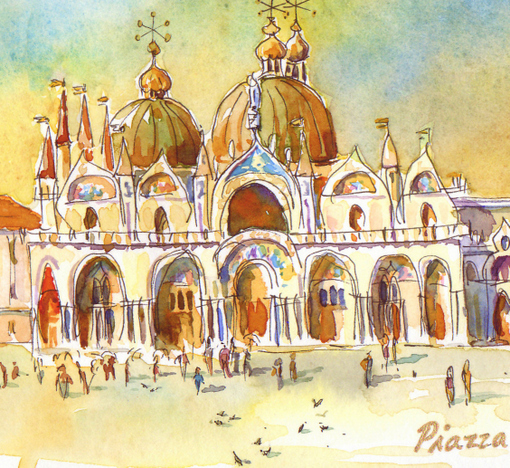 My impression of one unforgettable day when I walked in the footsteps of Leonardo, Monet, and Vivaldi in the Piazza San Marco, Venice. 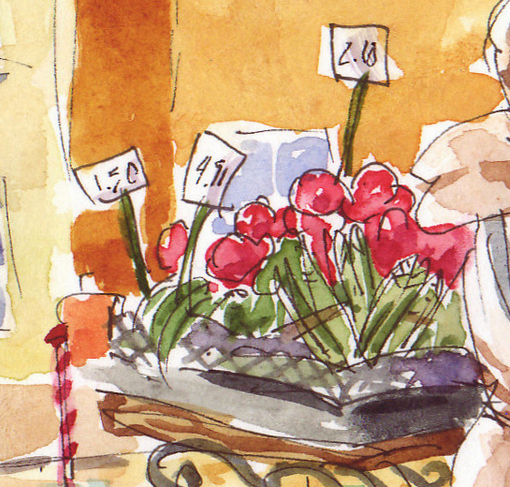 Have you always wanted to learn how to sketch, but didn't know where to start? Well, here's the opportunity you've been waiting for! 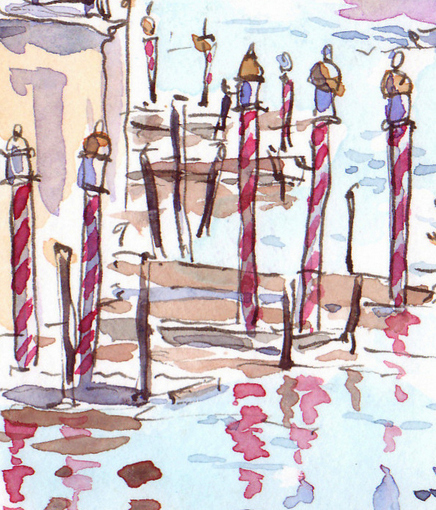 In just a few weeks, I'll be teaching a comprehensive 8-week class called "Sketchbook Journaling for Beginners" at Wash Arts in Washington, PA. 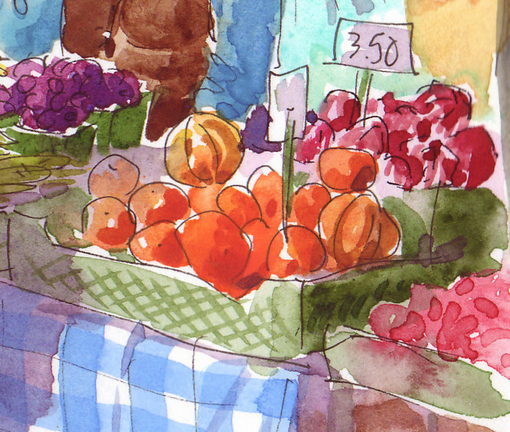 This no-pressure, fun-filled workshop will start you off with simple materials and easy techniques to begin drawing the world around you. 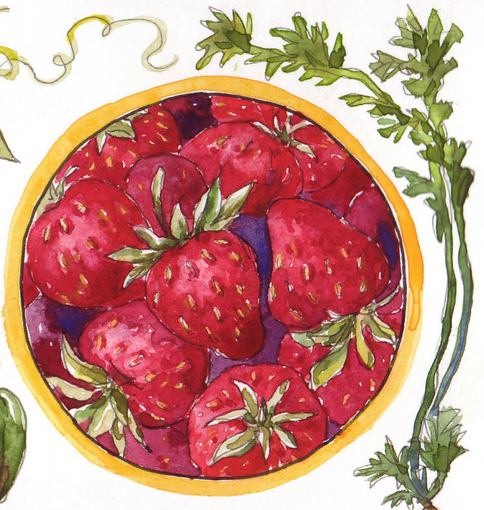 Then we'll jump into the wonderful world of watercolor and play around with mixing, glazing, and spattering. To add some pizzazz to your sketchbook pages, I'll give you lots of great ideas for page layouts, borders, and lettering styles. 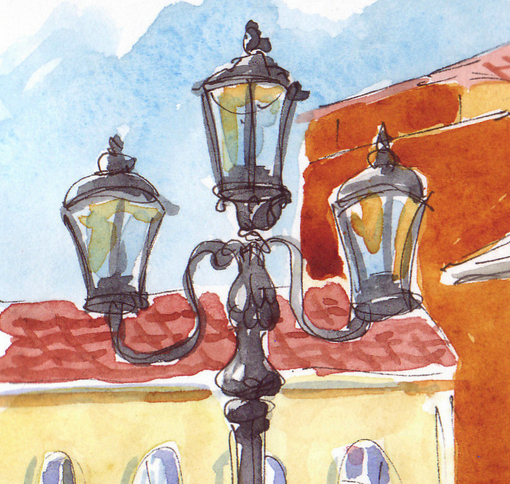 Recording a slice of life is what sketchbook journaling is all about. It's not about creating masterpieces; it's about being creative and noticing the little things that we too often pass by. 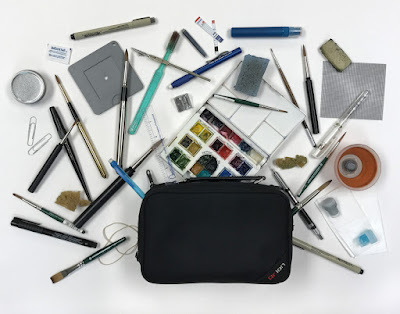 This class will give you the tools you need to confidently express yourself and record slices of your life on the pages of your sketchbook journal. 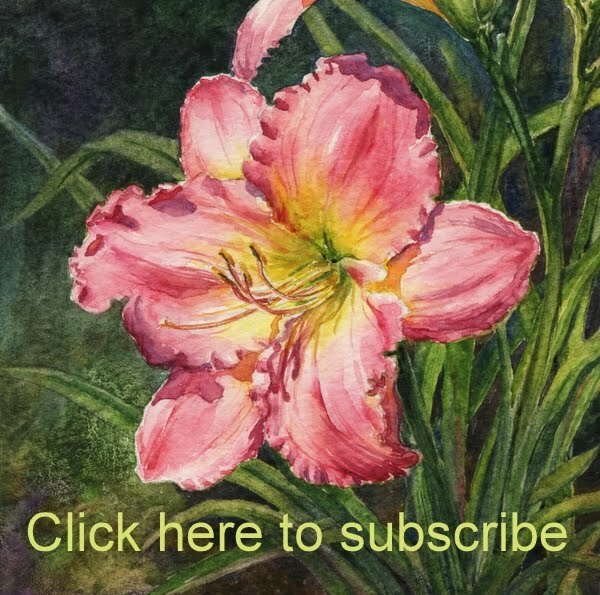 Even if you haven't drawn or painted since grade school, my hints and tips will help you to conquer your insecurities and start having fun with art again. I hope you can join us - space is limited, so sign up soon! Our granddaughter Callista is fifteen months old now, and, in our eyes, she's really something special. Her zest for life keeps us all on our toes, and her infectious smile is one of the prettiest things I've ever seen. Calliista's bedroom has pale pink walls and ivory/pink/tan bedding. 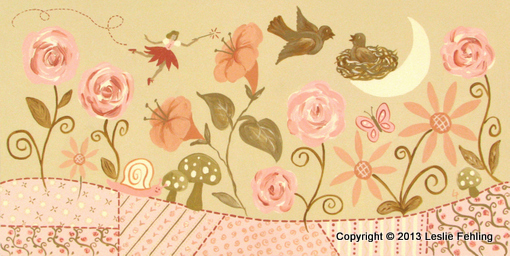 This year for Christmas I got the bright idea to do a flowery pink painting on canvas, to coordinate with the room decor and hang over her crib. Now, understand that I haven't painted on canvas since I was in college. What would possess me (three days before Christmas!) to pull out some old craft paints and try my hand at painting with acrylics? I must have been on a sugar high from eating too many cookies! At any rate, I finished the painting with hours to spare, and it now hangs in her girly room, looking down on teddy bears, baby dolls, and princess castles. I had a lot of fun playing around with acrylics on this project and on Nicholas' paintings. It might have been nice to have better quality paints, but then, there's a lot to be said for making do with what you have on hand. 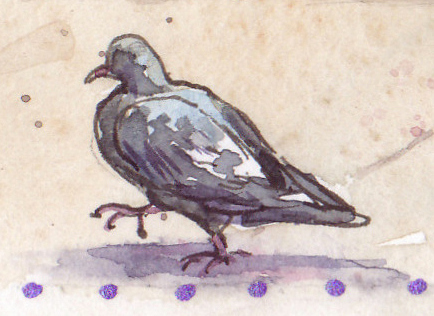 Today I'm heading back into the studio to take up my watercolors again. The holiday hustle and bustle has kept me busy with other things lately, and I'm itching to tackle some of the unfinished work I have waiting for me. 2014 awaits! I have lots of dreams and plans for the new year - I'd better get started! The holidays are over and I finally have a few moments to catch up with you all. The past few weeks have been a whirlwind, but now the peaceful days of January are here and things are settling down. The house seems so quiet after a week with lots of family, excited dogs, great food, crazy board games, new toys, home movies and cold winter walks. We had a wonderful time! One of the things I was most excited about on Christmas morning was seeing my grandson Nicholas open the gift I made for him, a set of three paintings of the things he loves best: cars, trucks, and just about anything with wheels and an engine. The paintings coordinate with the cars and trucks quilt my mom and I made for him. Acrylic on canvas, each painting measures 16" x 20"
The left panel (below) shows grandma and grandpa's house on the hill with a swing hanging from the tree in the yard. 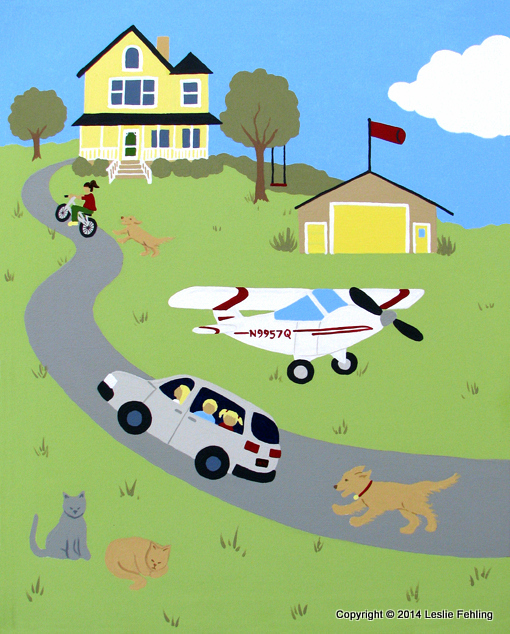 Nicholas' older sister, Lilly, is riding her bike up the driveway with their dog, Daisy, following close behind. Grandpa Freddie's Super Cub has just been pulled from the hanger and is preparing for take off. Coming up the driveway is mommy's van with Nicholas and baby Callista peering out the window. Our dog Buckley is greeting the van while the kitties rest contentedly in the grass. 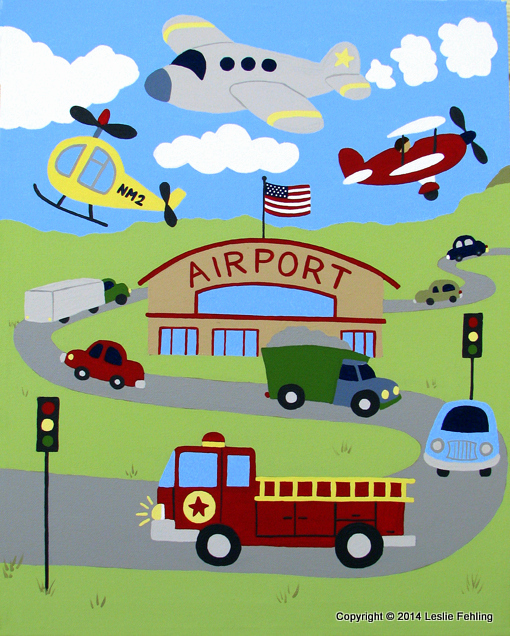 The road from grandma's house leads onto the center panel and passes by the Pittsburgh Airport where colorful flying machines fill the sky. Trucks and cars hurry along the road, busily going places. Nicholas' favorite vehicle is front and center... a bright red fire truck. 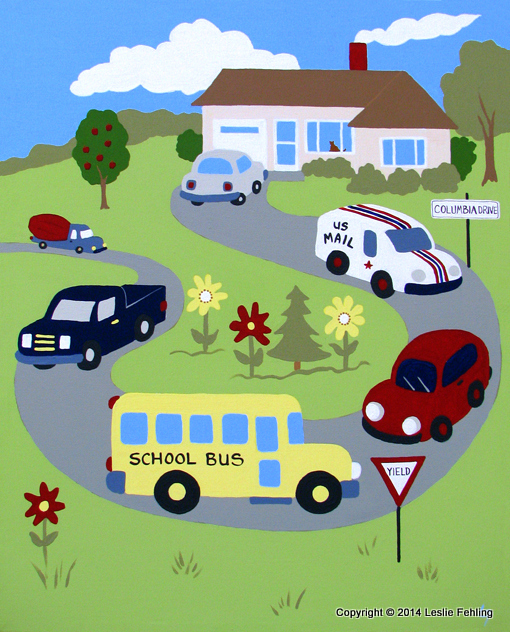 Finally, the road curves around onto the third panel and leads to Nicholas' house where Daddy's car is parked in the driveway and Buddy the kitty watches from the window. Along the way, we see a cement mixer, grandpa's Ford pickup truck, a postal van, great-grandma's little red car, and another of Nicholas' favorites, a big yellow school bus just like the one that stops in front of his house twice a day. The paintings hang over my grandson's bed where he dreams of piloting planes, driving big trucks, and visiting one of the happiest places he knows - Grandma's house!